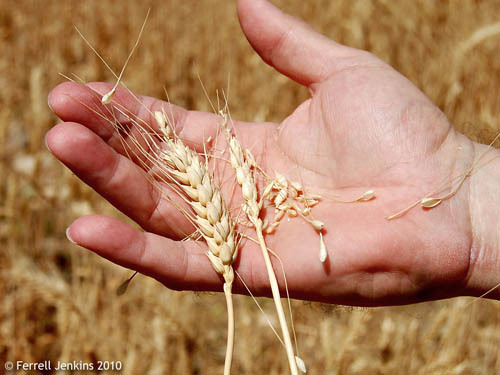 One of the best known parables of Jesus is the parable of the sower and the soils. Note the account recorded in Mark. Jesus used this simple, easily understood illustration to teach about the word of God and the hearts of men. Read the full account in Matthew 13:3-23, Mark 4:1-20, and Luke 8:5-15. A few years ago I was traveling in the vicinity of Hebron in late August and saw these fields that had been plowed and readied for planting. I assume the crop would be barley or wheat. I was standing on the road. You can see the rocks (be sure the soil is rocky), the weeds (if not thorns), and the good ground. 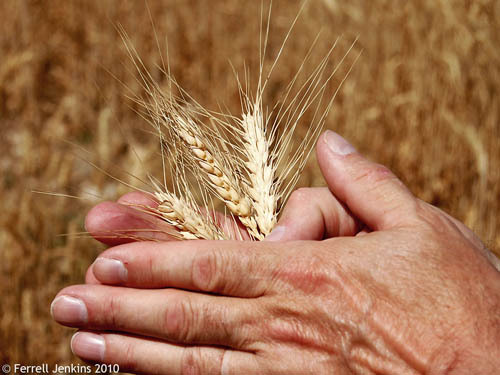 In the time of Jesus seed would be broadcast, scattered by hand. Seed would fall on all the areas, but only that which fell on good ground would bring forth an acceptable crop. 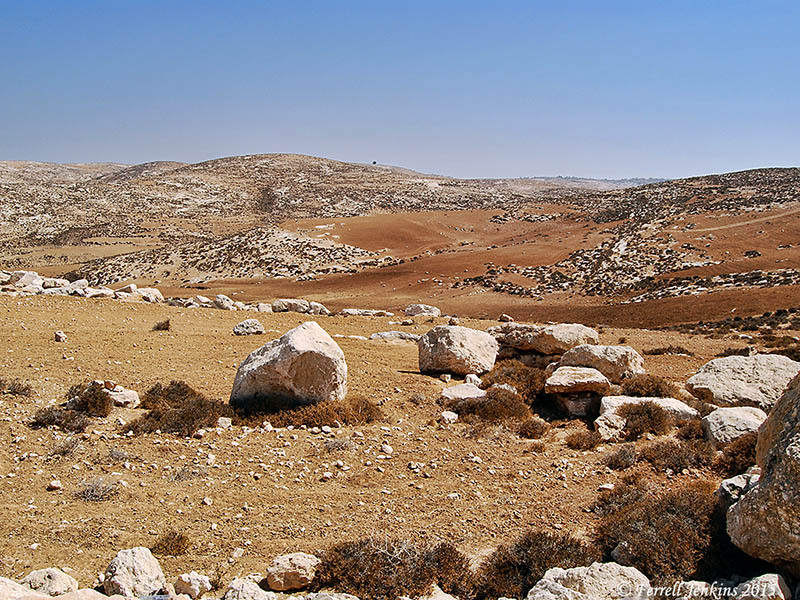 Many of the fields in the central mountain range north of Bethlehem are much smaller, but each field has the four elements of good soil, rocks, thorns, and road. How would you describe your heart? A field showing good soil, rocks, and weeds. Photo by Ferrell Jenkins. 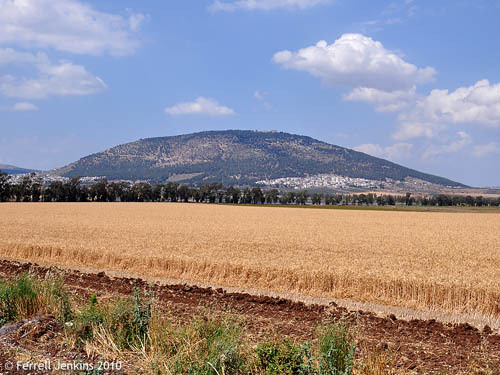 For photos of the area where Jesus likely taught this and other parables, see this post on The Cove of the Sower here. 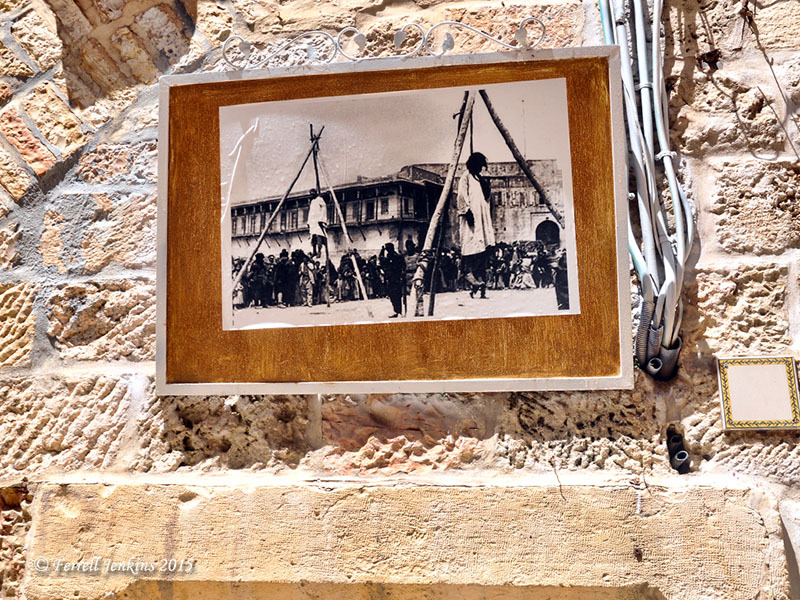 Though I have been in Jerusalem’s Old City many times, I have visited the Armenian Quarter only a few times. The Armenian Quarter is the southwest corner of the walled city. Entrance is easy from Jaffa Gate on the north, or from Zion Gate on the south. The name Armenia comes from the people who lived in the eastern portion of what we now know as Turkey. Old maps showing this name are easily accessible on the Internet. The area is sometimes referred to as Turkish Armenia or Western Armenia. According to many records there was a genocide of the Armenians in 1915 during the time of the Ottoman Turkish Empire. Popes and Presidents have cried out about the near-elimination of Armenians in the area. This brings us back to the Armenian Quarter of Jerusalem. From Jaffa Gate one walks along Armenian Orthodox Patriarchate street. The other streets bear the names of St. James, St. Mark and Ararat. 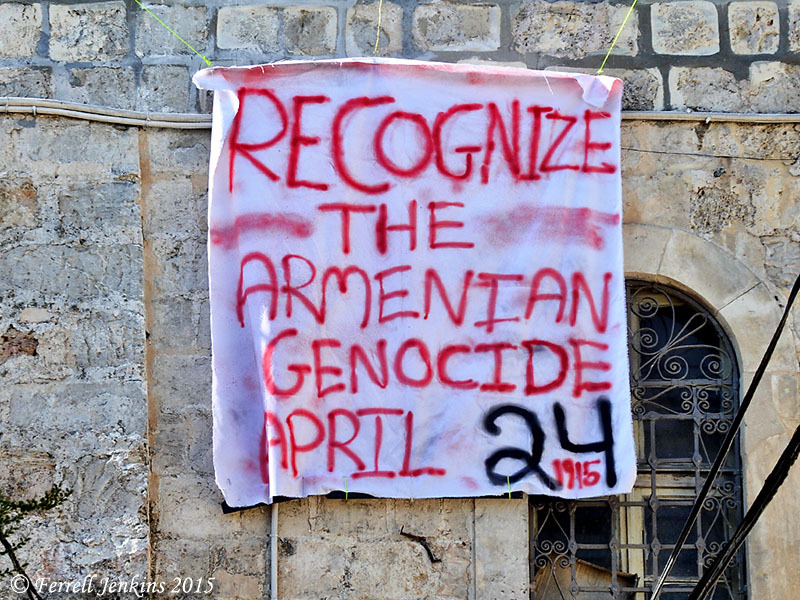 In 2013 I happened to be walking in the Armenian Quarter on April 24. This homemade sign caught my attention. Sign calling attention to the Armenian Genocide. Photo by Ferrell Jenkins. 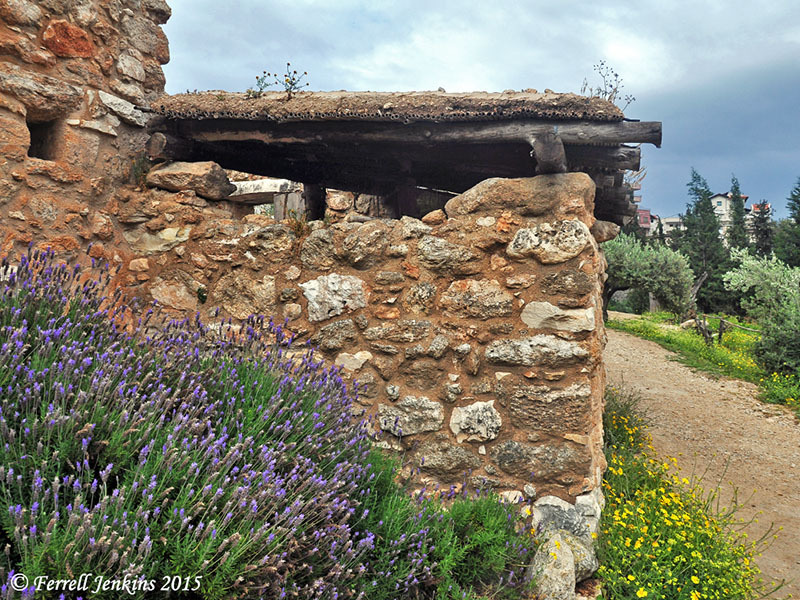 Have traveled in Eastern Turkey and seen the ruined Armenian churches I understood what this meant. Some residences (or businesses) displayed photos of events from the episode of 1915. Photo of the “genocide” above an entry. Photo by Ferrell Jenkins. Yesterday’s The Times of Israel carried a lengthy article titled, “Urging recognition, Jerusalem Armenians mark 100th anniversary of genocide.” The subhead reads, “Thousands marching on April 23-24 to commemorate massacre of 1.5 million, the ‘wound that all the time is dripping blood. '” The pictures are vivid. See the complete article here. Earl Irvin West, in the 3rd volume of The Search for the Ancient Order covers the period of the Restoration Movement from 1900 to 1918. West includes a few pages dealing with the preaching efforts of Churches of Christ in Armenia (pp. 357-362). One account begins in 1889 when a young man named Azariah Paul was supported by some churches in Nashville to preach in Armenia. Paul died from a sickness, but his brother Asadoor Paul continued the work. When World War I began, Paul wrote that he would likely be pressed into military service. He dropped out of sight and by the time of America’s entry into the war in April 1917, it was generally assumed he had been killed. …that all Syrian church buildings had been burned by them, that some people had been burned in ovens, that more than a thousand people had been killed in the vicinity of Charbosh, Persia. “Black Sunday” was December 21, 1914, when Christian people moved into American mission enclosures as their houses and property were looted and burned by Moslem soldiers. A related post about the region of Armenia is available here. Not much is left at the ancient Egyptian city of Memphis. This is not surprising to those who believe the Bible includes prophecy about various ancient nations. The prophet Ezekiel has this to say about Memphis. The alabaster sphinx of Rameses II (13th century B.C.) is one of the nicest pieces on display at the open air museum. It is also one of the few artifacts to be seen. The prophecy has surely come to pass. 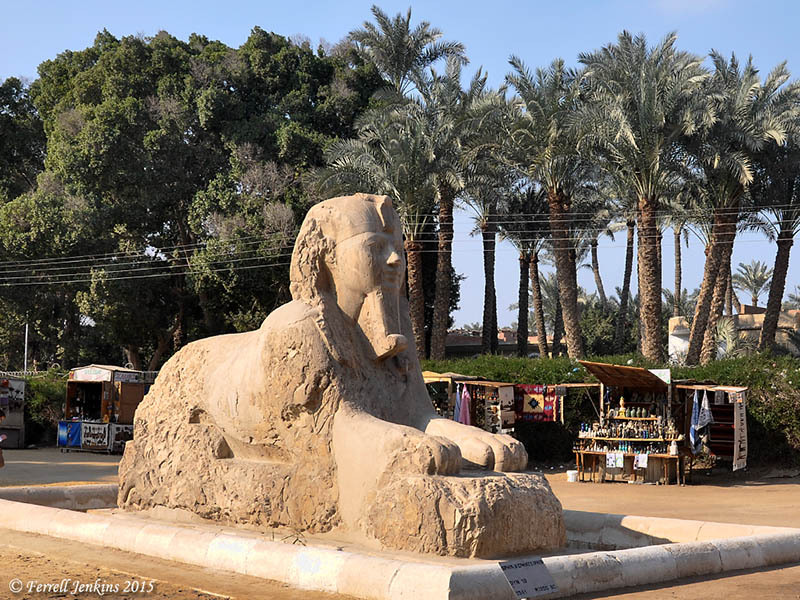 Alabaster sphinx of Rameses II at Memphis. Photo by Ferrell Jenkins. A recent article in The Cairo Post here reports that an archaeology team of the Russian Institute of Egyptology has uncovered ruins of the enclosure wall that surrounded Memphis about 3200 B.C. The article includes a note saying the new Grand Egyptian Museum, being built near the Giza Pyramids, is scheduled to open in 2018. The uprising in Egypt that occurred in 2011 has caused the delayed opening of the Museum. When Jesus was questioned by the scribes of the Pharisees about how His practices differed from those of John the Baptist, He gave three similar illustrations to teach the newness of His teaching and practice. The third illustration is about putting new wine into old wineskins. As the wine ferments it expands and stretches the wineskin. If an old wineskin is used, the expansion will cause the wineskin to explode. Our photo below shows an animal skin being use for churning, but it is easy to understand wine being placed in an animal skin like this. 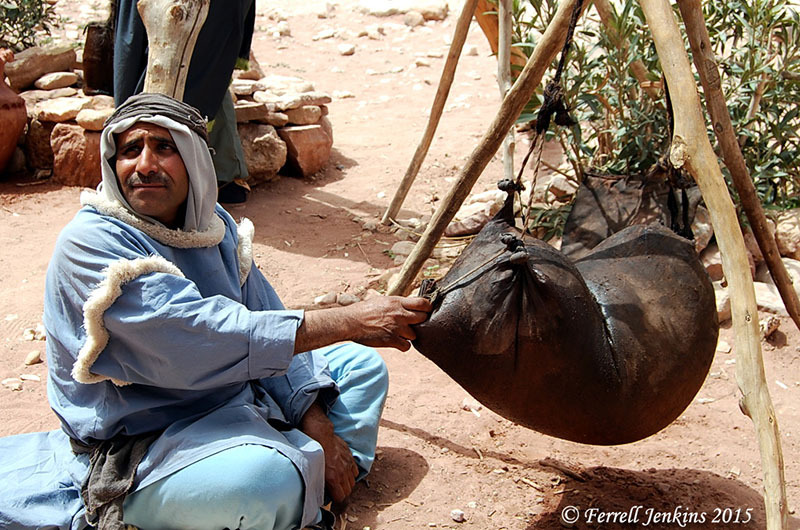 A Bedouin at Petra using an animal skin for churning. Photo by Ferrell Jenkins. More likely, however, they would use wineskins for this purpose. These are the “bottles” of the Bible. A wine bottle was made out of a goatskin, sewn together where it had been cut to remove it from the carcass. This formed a sack that could be tied at the neck and hung up. The resilience of the new rawhide took up whatever expansion might result from the process of fermentation. Of course, no one would think of putting “new wine into old wineskins,” since the old dried and cracked skins from the previous year were unsafe (Matthew 9:17). (Klinck and Kiehl, Everyday Life in Bible Times, p. 54). Elihu used the same illustration in defense of his much speaking. During the ministry of Jesus at Capernaum four men brought a paralyzed man to see Jesus, likely seeking healing, but there were so many people in the house that it was not possible to get in to see Jesus. Reconstructed house at Nazareth Village showing roof construction. Notice the few weeds growing on the roof. Photo by Ferrell Jenkins. Craig S. Keener describes the way the roofs of these houses were constructed. 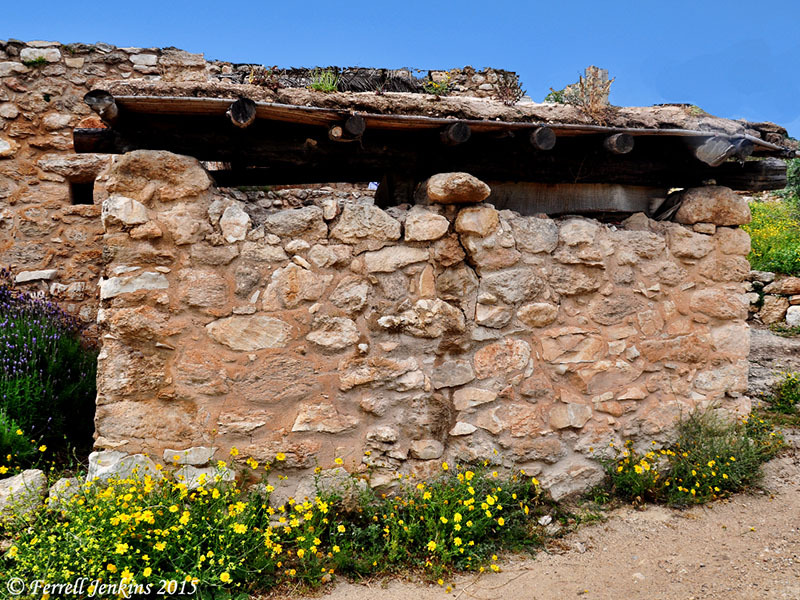 The picture below shows a reconstructed house at Nazareth Village with a roof like the one mentioned above. Notice the beams made from small trees, the mud on the top, and some grass and weeds growing in it. Reconstructed house at Nazareth Village showing roof construction. Photo by Ferrell Jenkins. 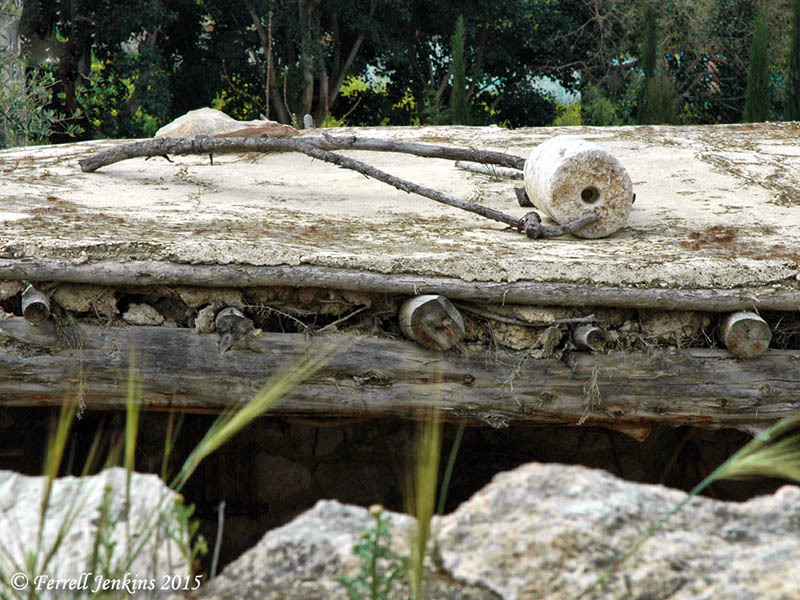 The next photo shows a portion of a roof made from wood and mud. You will also notice a roof roller on the roof. After the winter rains it was necessary to pack the roof with a roof roller. Roof rollers are commonly discovered during archaeological excavations. While reading Romans 13 I came to Paul’s admonition to the saints at Rome, “Would you have no fear of the one who is in authority? 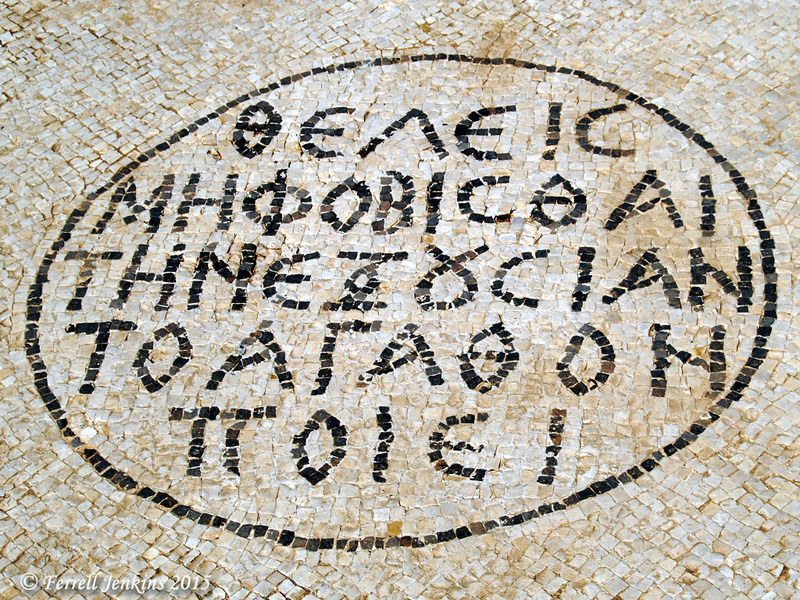 Then do what is good.” My mind immediately turned to the mosaic which was discovered during the excavation of the Byzantine public area at Caesarea Maritima. The context in Paul’s Epistle to the Romans reads this way. Mosaic Treasury at Caesarea Maritima. Photo by Ferrell Jenkins. I suppose they did not understand that this is politically incorrect!